Since 1998, when we began our project at Tree House lodge, we have always had several important goals in mind: to leave the minimum possible trace of our existence and to be as ecofriendly and sustainable as a small eco lodge could. Since the beginning of our adventure at the Iguana Foundation and the tree house lodge, we have concentrated on an ambitious plan of recycling and regeneration, social consciousness and education. The Certificate for Sustainable Tourism is a globally recognized program sponsored by the Costa Rica Tourism Board that seeks to categorize and certify tourism companies on a scale from one to five leaves according to the degree to which its operations contribute to a model of sustainability (five being the most sustainable). Its main purpose is to improve the way in which the natural and social resources are managed, to motivate the active participation of the local communities, and to support the competitiveness of the business sector. The CST, regarded as the strictest and most demanding program in the world for verifying the sustainability of hotels, eco resorts and tour operators, awards from one to five “green leaves” to those entities which participate in the program. As of April 2016, there are 231 hotels and 79 tour operators in Costa Rica which are certified by the CST. Only 49 hotels are certified with the highest standard: 5 leaves. · Tree House lodge prohibits the feeding of any animal. As cute as an animal can appear, please do not feed them, this will interrupt their natural habitat and habits and can infect them with viruses or bacteria. Moreover, it will cause these animals to become dependent on humans. · It is prohibited at Tree house lodge to hunt any wild animals. Please report any illegal or strange activity you might see along the trails, around the hotel or in its surrounding areas. · Remember to leave natural areas pristine and beautiful. Do not leave any trash behind during your visit. 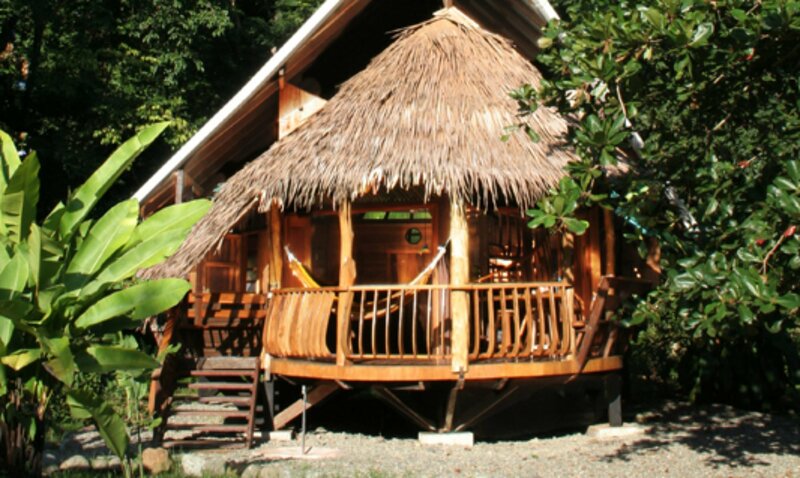 · Tree House lodge prohibits the extraction of any flora out of protected areas or nearby beaches. Please do not take any samples of plants, branches, flowers or seashells that you might find in our paths, nature trails or along the sand, no matter how beautiful they may appear. · Keep your eyes down while walking. Be mindful of your step. · When you want to look at something, stop moving! Look before touching. · Our wastewater is cleaned by water lilies. · Local employees are involved as much as possible, preferable from the province of Limon, if not other areas close by. · Local small businesses are preferred when buying food, crafts and services such as tourism, transportation, furniture design, craft making and other hotel structures, generating economic stability for the surrounding communities. · Our gift shop sells products from small local businesses, crafts made of recyclable materials, crafts from native groups, crafts from entrepreneur local women, organic products, and products from associations that work to protect the environment. · Zero tolerance policy towards activities related to sexual trade, sexual exploitation of minors, prostitution or drug trafficking. If such activities are detected, they will be reported. · We implemented a water saving program in the hotel. · We implemented a solid waste management programs such as recycling Creating awareness for our guests.